Everybody who stands close to nature and believes in the power of every season, can´t avoid it; there are five unique seasons, with fruits, vegetables and herbs which are authentic for that time of year. Rungis has 5 seasons with potatoes, fruits and vegetables: winter, spring, early summer, summer and autumn. Fruits and vegetables, harvested in their own season, are tastier, cheaper and ‘greener’. If it also comes from the area where they originally came from, where their roots are, the taste is optimal. Sounds easy, and actually it is. Beets, cabbage, sprouts; don’t say the winter is a less wealthy season. And what about all the citrus, which is now at its best. A new spring… new flavors. Celebrate spring with creamy white asparagus, flowers on the plate and lettuce with the dew still on it. It’s time for flowers. In fact, they are allowed on the plate. Along with all those wonderful fresh lettuces the early summer brings you. The summer with its abundance: plenty of choice, plenty of flavors and most of all, plenty of color. Juicy ripe tomatoes, sweet peppers and delicious soft eggplants. Less color, but definitely no less flavor. The roots are big and thanks to the lower temperature, pleasantly sweet. 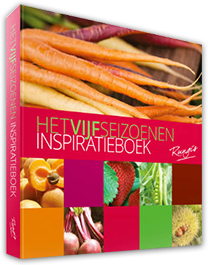 Over 275 pages of inspiration! You can hear it everywhere: they deliver quality. Thanks to them i'm always assured of good stuff. When buying the right ingredients, your already half way there.